Submitted in 2009 by Michael Heitner '60; updated in May of 2009 by Thad Bennett '76. Do you have a story of your own to tell? Please email the webmaster and we'll find a spot to showcase it! For years there was a Friends of Dartmouth Rowing that made rowing possible at Dartmouth because it was not an “official” sport of the college. 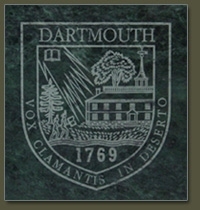 The Dartmouth Rowing Club was funded only by the Friends and by undergraduate dues. That changed in the late 1960s, when rowing became part of the official sporting life at the college. After that, the FDR became less necessary and the DRC was used mostly to register the crews for the Head of the Charles and, later, for summer regattas. However, in 1975-76, the undergraduates at the College saw a need to revitalize the Friends organization. Thad Bennett ’76, President of the Dartmouth Rowing Club (DRC), thought it would be possible to tap the old Friends system to help carry the financial burden that comes with modern rowing - oars, speedy shells, coxboxes, and more. He saw the Friends as a great means by which to connect undergraduates to the passion for rowing of the alumni/ae. It started with members of all the crews spending hours during the winter months copying the rosters from every year book, looking up each person’s alumni “computer number” and getting it placed in a rowing database. Finally, we had a resource. With that came the first letter inviting alumni, once again, to support rowing at Dartmouth. In the spring of 1976, That Bennett complained to Thad Seymour (who had returned to Hanover to announce one of the races over WDRC radio) about the lack of an FDR organization and alumnae support. Seymour did not miss a beat: “In 2 months you’ll be one of the people you are complaining about!” Soon, there was a structure: The Stewards of the Friends of Dartmouth Rowing. Thad Seymour served as Chairman and Thad Bennett as President – the only known organization with two Thads! Hart Perry agreed to serve as Vice- President along with Mike Heitner, Bill Subin, Ned Northrup and others. Thad Seymour was a varsity heavyweight oarsman at the Kent School and then Princeton who volunteered as our head coach during the years that he was a young instructor in the English Department at Dartmouth. He rejuvenated and energized the entire sport of rowing during his years at Dartmouth -- deftly maneuvering the College administration to see the light about our sport. Seymour went on to become a full professor, then Dean of the College, and later the president of Rollins College. Hart Perry became the driving force behind lightweight rowing at Dartmouth during his undergraduate years, when he was aptly referred to as "Pep" Perry, I believe taking the first Dartmouth crew to Henley. Hart returned to Kent where he served as dean and head crew coach. Hart was a member of the Board of Stewards at the Henley Royal Regatta for many years (indeed, the first non-Commonwealth member of that club). He is now the executive director of the National Rowing Foundation and should be thought of as "Mr. US Rowing." Among other accomplishments, Thad Seymour and Hart Perry were responsible for bringing Peter V. W. Gardner from Princeton to Hanover, as our first full-time professional rowing coach. At the end of that memorable meeting, Thad Seymour closed the meeting with, "Gentlemen, take out your checkbooks." Which we happily did. The high point of the Friends to date has been raising the funding for the new boathouse, an effort that began in 1983. Allan Hunter, Mark Gates, Ned Northrop, Thad Bennett, Andre Hunter and hundreds of other rowing alumni, parents and good friends contributed generously of their wealth and energy, to the point where we jubilantly presented the College with a fait accompli in the form of 100% funding for the project, an offer that President McLoughlin could not refuse. The dedication of the Friends of Dartmouth Rowing Boathouse was celebrated in the fall of 1986.